Cinelicious Pics has brought out a flawless Blu-ray. A wonderful transfer. A beautiful restoration. A wonderful array of special features. This is clearly one of the best products to come out this year. I highly recommend this Blu-ray for any diehard movie lover. This odd and strange New Wave film came out in 1969. This is a priceless example of perfected, Cult status cinema. This wild over the top little tour-de-force piece of Queer Cinema, truly makes the viewer take a trip into a world of far out realities. From Japanese’s Drag Queen bars, to drunken art house style of cinema. This truly is a one of a kind experience. An experience that showcases a somewhat dream like state. An arthouse landscape of a vibrant work of art come to life. This 105 minutes is a visual ecstasy of light and dark visuals. A pure avant-garde mastery that must be seen to be fully understood, or fully appreciated. Toshio Matsumoto gave the world an inner quality that he could only create. A mind showcasing a pure one of kind bliss. To be honest this is a one of kind experience. This Blu-ray also comes with 8 Avant-Garde Short Films. 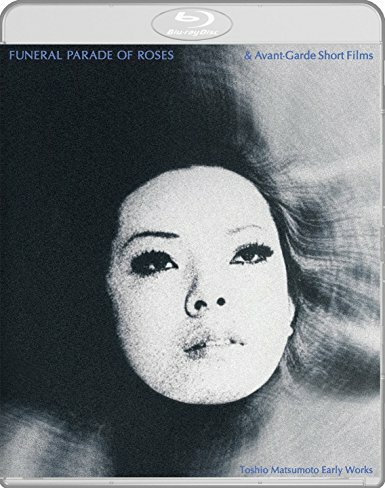 It’s hard to write a review and express what Funeral Parade of Roses is about. It’s hard to express on paper in written form the experience one gets from this art-house journey of mythical exploration. This is something that must be experienced to fully grasp the importance and mastery quality that it is. Funeral Parade of Roses and all the 8 short films are directed and written by Toshio Matsumoto. Sadly, this genius and master of Avant-Garde New Wave film passed away this year on April 12th, 2017. His 85 years at life was a pure treat for lovers of truly special, one of a kind, and very original pieces of cinema. You must realize the time this film came out in. It’s 1969 and it’s Japan. This film depicted homosexual imagery which was unheard of at the time. The frank nature of this film is controversial for its moment in time in 1969. Watching it now I am floored this movie was able to appear. Toshio Matsumoto directed 6 Documentary Shorts, 24 short films and 4 feature Films in his career. His talent is above and beyond many directors. I think the cinema world or those who want to be directors should view Matsumoto’s work. The plot of the film follows and displays the ups and downs of a character known as Eddie, who is a young gay boy, and also other transvestites located in Tokyo. You visit the bars and streets and actions of this wild crew of unique individual. This experimental style film stands out in the eye-opening reality of watching what seems like true life unfold on screen. The mixture of arthouse, and documentary style of film making shines in all it’s retro glory. Now for an interesting note is this film influenced one of the all time greatest directors in cinema, Stanley Kubrick. This film influenced a great deal for the 1971 masterpiece, A Clockwork Orange. The audio and video are spot on perfection. Crystal clear in sound. Crisp imagery. A perfect blend of perfection. Never seeing this before I can’t compare it to anything, but trust me when I say, this film is mastered in complete perfection. The Blu-ray is spot-on clear in audio and video. 4k Restoration from the original 35mm camera Negative. · Audio Commentary by Chris D.
· A booklet with a new Essay by Hirofumi Sakamoto Director of Postwar Japan Moving Image Archive. 16 pages with pictures. This moving masterpiece of Arthouse art should be owned and experienced by all lovers of cinema. It is an important piece of film. It’s mastery in image and actions lead the viewer into a realm of only an Avant-Garde style film can be. Truly dramatic, and plainly put, a masterpiece of art come to life on screen. Cinelicious pics has brought out an important and flawless example of a Special Edition Blu-ray that is by far one of the best products of year. http://www.cineliciouspics.com/ to buy all the wonderful DVD’s and Blu-rays. The main page that gives you these beautiful releases on top quality Special Editions.